Dress the shank with tying thread and add a red tag around the bend. As an additional attractor a couple of fine rubber strands can be added at this point to hang down off the bend. Add the moose mane hair at the tie off point of the tag, using one brown and one white hair. Wind forward in touching turn to create a segmented effect to a point about 1/3 of shank length behind the eye. I like to add a fine layer of UV resin like Solares, to the abdomen and harden with the UV torch to toughen the moose mane hairs. 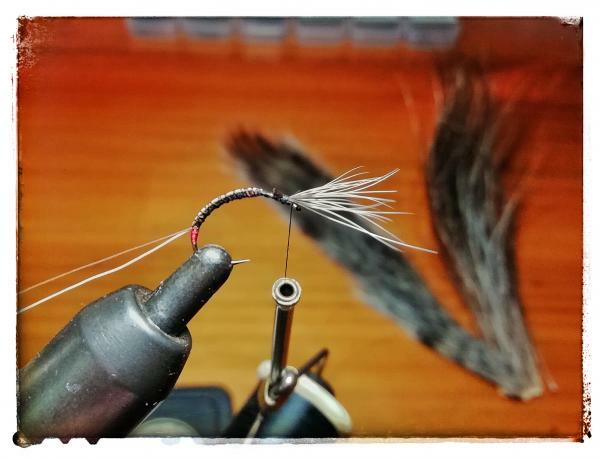 Add a small bunch of squirrel tail hairs (10 to 12) and facing over the eye about shank length, secure and trim excess. Make sure you leave approximately 2mm behind the eye free for tying off later. 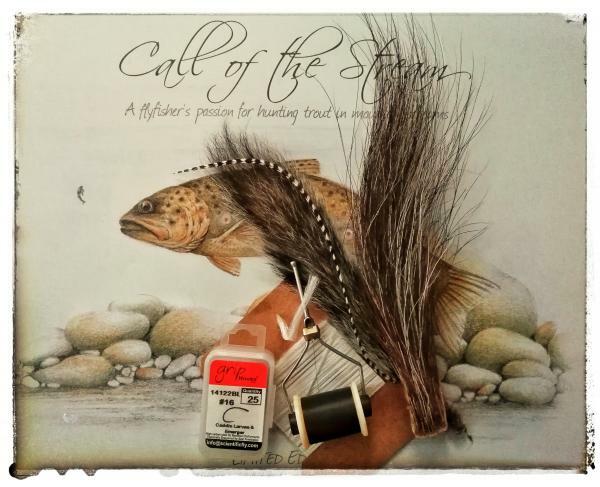 Add the post at a point where the squirrel tail hairs have been tied off and attach the hackle to the post. Add the peacock herl at the base of the post and wind a few turn behind and a couple in front of the post, tie off and trim excess. 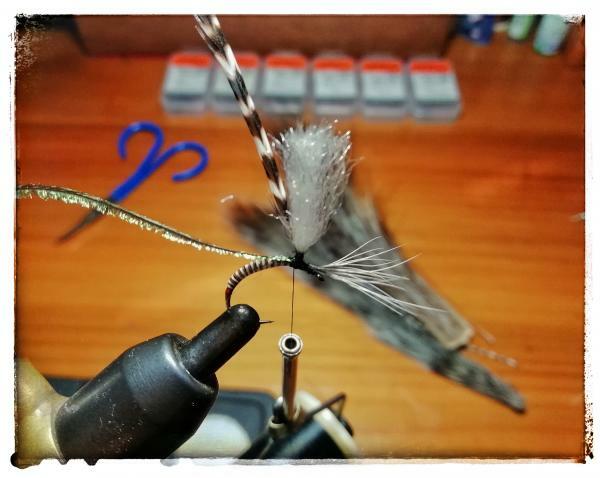 Wind the hackle feather around the post with 3 or 4 turns, secure and trim excess. 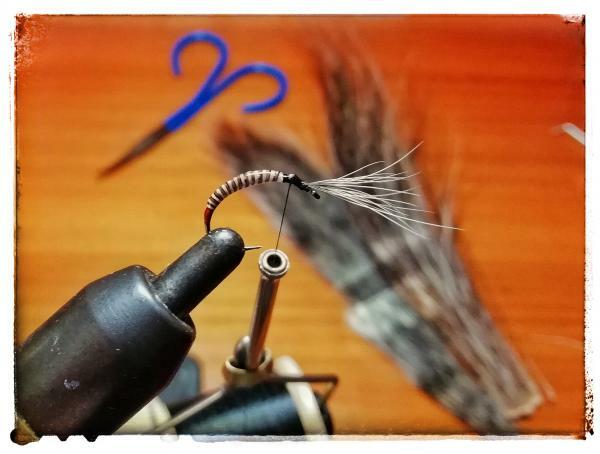 Take the tying thread to behind the eye, form a neat head and whip finish. Complete by varnishing the head making sure there is no varnish in the eye. 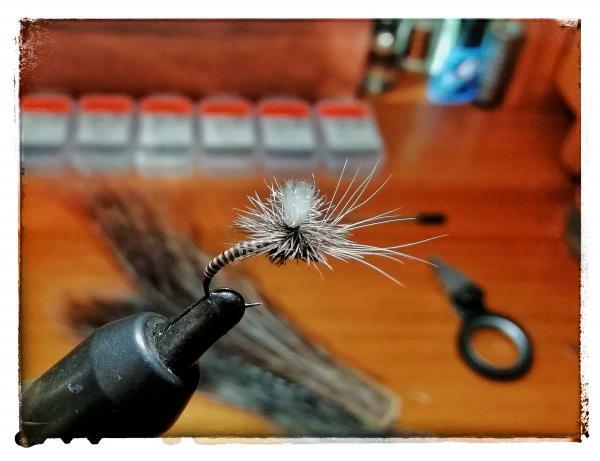 This variant of the original Hans van Klinken’s Klinkhamer has proved to be a very effective emerger imitation representing the natural insect in the throes of shedding its nymphal exoskeleton and struggling in the tension of the surface film - a vulnerable stage for the naturals and easy pickings for the trout. The Squirrel hair is not only an added trigger representing legs and feelers, but in a light breeze also causes the fly to vibrate giving it the perception of life as the natural insect would do trying to free itself. The fly can be fished as any dry fly, dead drifting it over the most promising feeding lies, edges of current seams, along undercuts and beneath overhanging vegetation. Important when adding floatant to the fly is to keep the abdomen free of it to ensure that this section of the fly sinks below the surface as the abdomen does with the natural insect. The use of moose mane as opposed to the usual dubbing for the abdomen also aids it sinking below the surface, just where you want it. Even when there is no sign of trout rising the fly has proved to be a good searching imitation. There have been days when I have used nothing else other than this little imitation - one fly days.